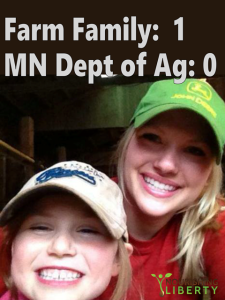 Home Agriculture UPDATE: Minnesota Farmer Victorious in Court! In the sto­ry of David and Hei­di Berglund from last week, was a glimpse into the over reg­u­la­to­ry nature of the Min­neso­ta Depart­ment of Agri­cul­ture (MDA). The MDA threat­ened a peace­ful fam­i­ly with $500 per day fines for feed­ing their com­mu­ni­ty. On March 9, 2015, 175–200 com­mu­ni­ty mem­bers sat qui­et­ly in the court­room in sup­port of the Berglund fam­i­ly. While this is a pos­i­tive devel­op­ment in the case, it is cer­tain­ly not over yet. If the judge’s final rul­ing is in favor of the farm, it is like­ly that that MDA will pur­sue an appeal. The ulti­mate deci­sion here will set a prece­dent not only for Min­neso­ta, but one that oth­er states could fol­low. The rul­ing, expect­ed in 90 days, will deter­mine, in large part, the lev­el of aggres­sion the gov­ern­ment uses to per­se­cute farm­ers (and con­sumers) who seek to engage in peace­ful vol­un­tary exchanges for food. Please sup­port the fam­i­ly in any way you can. They have sig­nif­i­cant legal fees to pay as well as oth­er expens­es relat­ed to time in court. To fol­low the case close­ly, as writ­ten by one of the farm’s long-term sup­port­ers, go here.